Gold hit another fresh 1-year lows at $1211.43 but staged a strong recovery of more than $10 after the Dollar came under heavy selling pressure following US President Donald Trump's unorthodox comments about the Federal Reserve's monetary policy. Trump is not interested in a strong Dollar as he is ready to proceed with the trade war on China which gives back Gold its allure as a safe haven instrument. 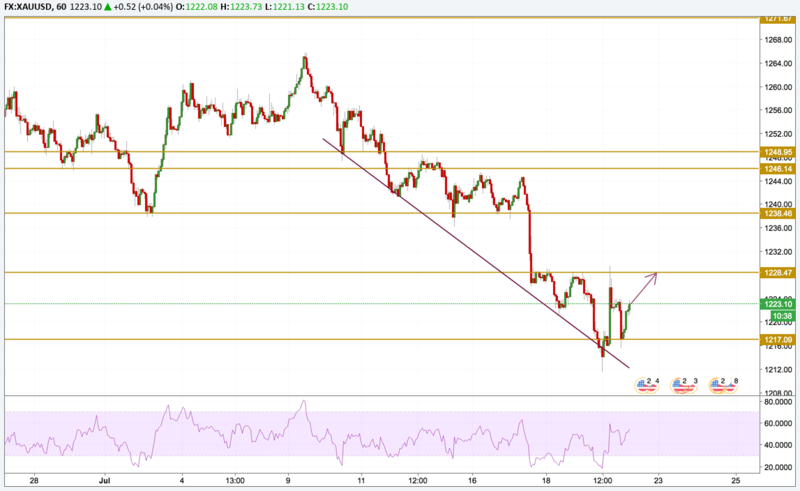 Gold continued with its free-fall touching fresh new lows before retesting the $1228.47 resistance level again. The current price is back near the $1222 level and with a strong bullish momentum, the price could rise again and break the $1228 resistance level and at this this point this will be the level we will be focusing on.